Gone Fishing » Blog Archive » Visit to Alexander Bay. Monday (6th) was pretty chilly and misty in the morning. 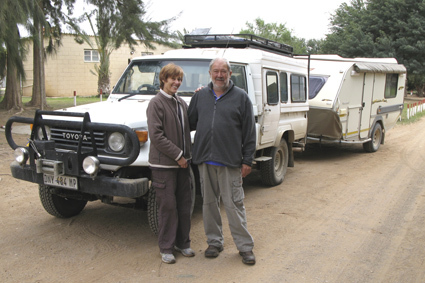 I woke up fairly late and by the time I got out the caravan Koos and Lieta were all packed, hitched up ready to leave. I was quite sad watching them go as they had been great company for the past 2 days. They were planning to travel through the Richtersveld and then into Namibia to go and visit many friends at various locations. Koos and Lieta Prince all hitched up and ready to continue their journey. About an hour after they had left the monkeys were back with vengeance. It was not pleasant as I was now the only one there and they went mad around and on my caravan. There must have been at least 20 of them from little babies to pretty big adults. There was nothing I could do as I watched them use the rally tent in front of the caravan as a trampoline. I was, after about an hour of this, getting really angry and frustrated and decided enough of this I have to leave. I even started packing up some of my things when suddenly they were gone and peace returned. I boiled the kettle, made some rooibos tea and sat down to think it through. I really did not want to leave yet as I still had to explore Alexander Bay and the only place I could move to was Port Nolloth 80k’s away and very expensive until after the school holidays. I decided the best thing to do was to go into Alex Bay so I could get away from Brandkaros for a while and calm down. 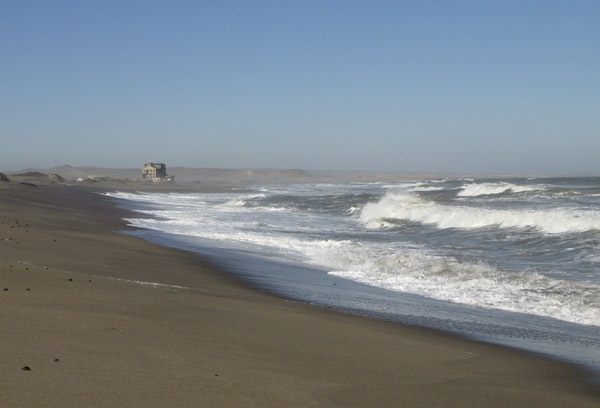 Driving on my favourite dirt road to Alex Bay, to be honest without the caravan behind the road was not too bad, I wondered how I was going to get information on where to go and what to see. I had been to Alex Bay 40 years previously and remembered very little of what it looked like but knew it had changed a lot. After signing in, to get into the town, I managed to find a Sentra shop, buy a few things and decided to have a cup of tea at the only restaurant in town. On chatting to the lady serving me I found out that the only person to talk to was a guy called Pieter van Wyk and he was the librarian. Found the library and walked in to find Pieter. What a shock!! I had somehow conjured up the image of an elderly man, as he new all the ins and outs of the town, and there was this young man of 21 standing in front of me. What a nice guy. (More about him later) We made an appointment to meet on Wednesday morning, as he only starts at 1pm on Wednesday, and he would show me round. It was still quite early so I decided to take a drive down to the beach and take a few photographs. 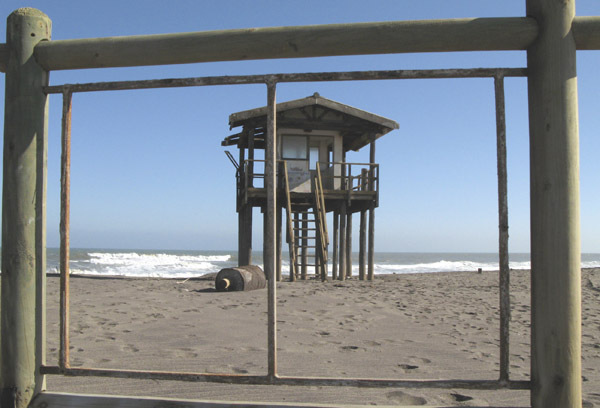 The guards old watch tower on the beach. This used to be a restricted area. Can’t believe those monkeys! I would have crapped myself – they can get quite vicious, can’t they? Gosh, that place looks desolate … interested to read what the librarian had to say about it, and where he took you. @JustBcoz The monkeys causing the most havoc were the youngsters and they were just having a jolly good time. Alexander Bay itself is desolate and it is even reflected in those shots at the beach. Hope I can do justice to the day I spent with Pieter the librarian as he was amazing. Dad, remember I spoke to you about arb comments from people (or bots) just wanting to get their links out there? Two of them have visited you in this comment stream … don’t bother to publish their comments. @JustBcoz Thanks! I will watch out for them. Let me know if you spot more of them.